The Zen approach to Project Management brings together sound wisdom, a nuts-and-bolts grasp of practicalities, and original insights. It's the Zen that's been missing in all too many of today's business books, and George Pitagorsky is the master we've needed. Daniel Goleman, author Social Intelligence. Projects are often more complex and stressful than they need to be. Far too many of them fail to meet expectations. There are far too many conflicts. There are too few moments of joy and too much anxi�ety. But there is hope. It is possible to remove the unnecessary stress and complexity. This book is about how to do just that. 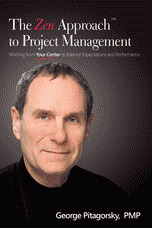 It links the essential principles and techniques of managing projects to a wisdom approach for working with complex, people-based activities. Project management becomes a metaphor for how we can live our lives and, if we follow the wisdom traditions, the way we live our lives becomes a metaphor for how to manage projects. The book guides readers in exploring how to: Remove unnecessary stress and complexity from your projects. Apply mindfulness and open mindedness to cut through the barriers to personal self-actualization. Manage expectations to ensure that people get what they need, when they need it and for the cost they expected to pay and that they accept what they get. Manage performance to cut through interpersonal and intrapersonal issues that get in the way of excellence. Break free of self-imposed barriers to creative thinking, conflict resolution and problem solving. Remain calm and energetic while being active and effective in the face of chaos, fear, resistance to change, unrealistic demands, conflict and the other aspects of project life that cause stress.